Koh Chang is located 300 kilometers (5 hours) to the southeast of the capital of Thailand – Bangkok and is the third largest in the Kingdom of Thailand after Phuket and Samui. From north to south for 25 km, and its width is 9 km and the total area is approximately 215 sq.km. Koh Chang with its adjoining 53 large and small islands is the archipelago of Mu Koh Chang Marine National Park. Wonderful long sandy beaches, diverse marine life and coral reefs of the archipelago attract thousands of tourists to the island every year. The name Koh Chang (เกาะ ช้าง) in Thai means “Elephant Island”. The island received its name due to its shape, which on the map resembles the head of an elephant, turned towards the Kingdom of Cambodia. What is surprising is that originally elephants were never evolved on the Elephant Island and all are imported from Isarn province. Koh Chang is one of the most famous resort islands in Thailand, not only among visitors, but also among the Thais themselves. About half of the tourists visiting the island of Koh Chang annually are subjects of His Majesty Mach Vachiralongkorn, King of Thailand. Thais come for a weekend from Bangkok and Pattaya, spend holidays, celebrate family, national and religious holidays. Thus, on Koh Chang, three New Years are celebrated: European (December 31-January 1), Chinese (late January to mid-February) and Thai (mid-April). In 2018 local Songkran falls on April 13-16. Interestingly, in addition to the Mu Koh Chang archipelago, some of the islands located to the south of it also belong to the archipelagos Mu Koh Mak and Mu Koh Kood . These three archipelagos are united in one national park. Altogether there are 52 islands, from very small to such large as Koh Kood, the fourth largest island in Thailand after Samui. On the islands of Koh Vai, Ko Mak and Ko Kud, there are hotels that offer vacation in a bungalow by the sea. Pastimes of this kind will suit those who are tired of civilization and want to spend a few days enjoying the clean, warm sea and beautiful beaches. When to visit Koh Chang? Due to the tropical climate, the weather on Koh Chang can be divided into three seasons: “wet”, “monsoon” and “dry”. “Wet season” – this is the rainiest months of the year – May and September. “Monsoon” season is considered the hottest and lasts from June to August; In July, for example, an average of about 700 mm of precipitation falls. Usually, a tropical rain on an island is a 30-60-minute night or morning shower. After such rain, as a rule, everything dries within an hour, after which the humidity of the air increases significantly. “Dry” season, which tourists call turquoise because of the azure water off the beaches, lasts from October to April inclusive. I must say that the names of the seasons are translated from Thai and indicate the attitude to the weather of local residents, so do not be afraid of the “cool” season – for the tourist it will be sunny and warm, and “wet” in turn – sultry and with scorching sun. But, tourists visit the island of Koh Chang all year round. And, despite the fact that it is in the “cool” season, the temperature for most tourists is optimal, it is during this period waterfalls of the island and the river remain without water, and prices for accommodation are significantly increased. In the summer, during the rainy season, waterfalls fill with water, vegetation starts to blossom blossom, and prices become more profitable for tourists. Separately, it is worth paying attention to October – this month is always attracted by a large number of tourists, connoisseurs of the island, because within a month the weather is already stable, and the prices for many hotels until November 1 still remain at low levels of the monsoon summer. Koh Chang also takes its humble place in world history. In 1941, during the occupation of Japan, the Thai and French navy fought in these waters. As a result of the battle, three Thai ships were sunk, the French did not suffer losses, but retreated by misunderstanding. Until now, at a 15-meter depth 200 meters from the shore in Salak Pet Bay and near Koh Klum, Thai wrecks are of interest to divers from around the world. Until the mid-70s, few people heard of the island, but it was then that the first European travelers came here. In 1982, the islands of Koh Chang Thailand and the surrounding islands were recognized as the national conservation area of ​​Mu Chang. Only since 2000 Koh Chang began to be built up point by point in hotels and hotels, and the tourist boom occurred in 2002. Most of the island, its “core”, which is about 80%, is occupied by mountains and jungles. Usually, the island is divided in half – the west and east side. Local villages and all tourist infrastructure are located along the coast. The highest peak (Khao Salak Phet) is 744 meters above sea level and is located in the jungles of Klong Kloi in the south of the island. Most of the beautiful beaches are located on the west coast. The eastern side of Koh Chang Thailand is not developed by tourists because of stony beaches, plus part of the coastal territory is occupied by industrial shrimp cultivation. Local residents of the island live by collecting rubber tree sap, cultivation of coconut and fishing. The road encircles the island, but does not close in the south. From the fishing village of Bang Bao to the village of Salak Pet the road is uninhabited. The reason lies in the enmity of fishing villages. Salak Pet, located on the eastern side of the island, is considered the oldest settlement on the island, but the vast majority of tourists visit Bang Bao, whose main population is Thai and Cambodian workers. In fact, even marrying a young man from one village and a girl from another is quite difficult, and there is no question of completing the construction of the road. 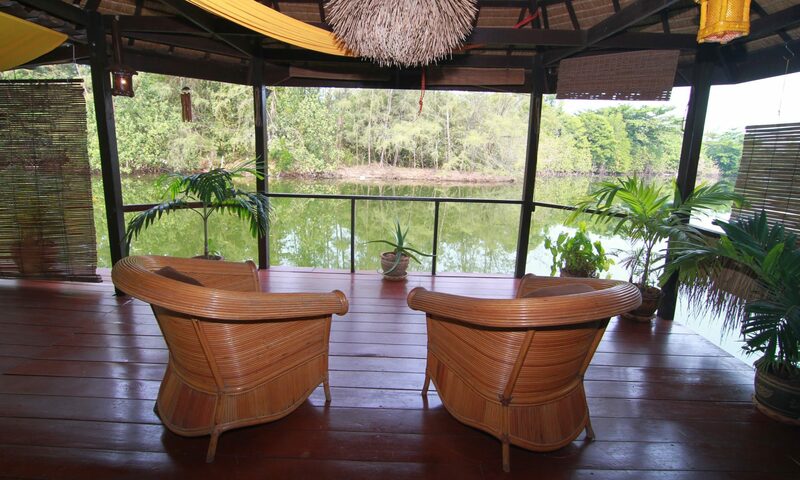 Despite the reputation of a quiet and serene calm place, Koh Chang also has bars, discos, restaurants and nightlife.